One of best ways to ensure you know what you are eating is to eat at home. With the kiddos and your extracurricular activities I know eating a home cooked meal is easier said than done. What you need is a plan. I thought I would share a page out of our Home Cooked Meal Play Book. One of our go to plans includes a whole chicken cooked over the grill on the weekend. A chicken can provide life saving left overs for week night meals. The chicken can be added to a stir fry, BBQ pulled chicken sandwiches, pastas, quesadilla, tacos, nachos, salads, anything. Here is one of our recipes we use to cook chickens on the grill. Prepare a grill for "indirect grilling". Optional: soak your favorite type of wood chips for smoking, for chicken I like apple. 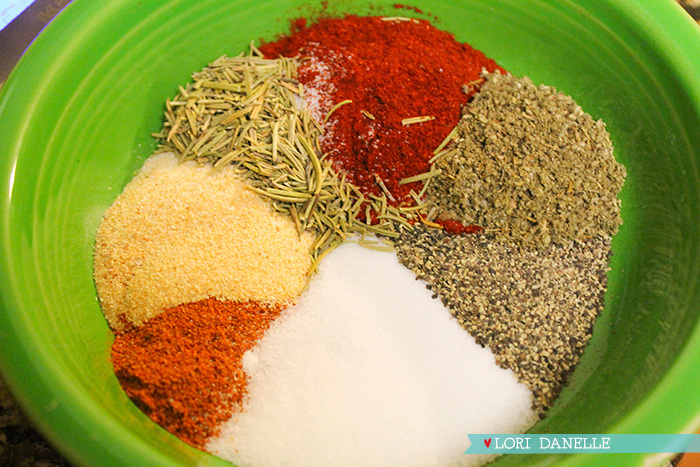 Mix all the spices/herbs together until well blended. Lossen skin of chicken and rub under and over the skin. Place chicken on the grill over "indirect heat." Baste chicken with olive oil every twenty minutes or so. Cook chicken until juices run clear and internal temperature reaches 160F. What is your go to menu item that saves your weeknights? Newer PostMy Little Pony Party – Sort of.